In “The 53rd Card: A Dark Tale about Finding Light,” Virginia Weiss paints the story of a lost soul haphazardly trying to navigate her way through a tumultuous life. This soul is Emma Addison, a slightly agoraphobic young woman who accidentally summons Lucifer after a series of dark events. It is then that Emma begins a strange relationship the devil, dancing through different mythos, magics, and stories to find her light at the end. What excelled best in this novel was the elegant mix of different myths and stories. Emma is an inquisitive character who refuses to ground herself in a single religion; instead, she chooses to embrace them all. This openness leads her to encounters with a myriad of beliefs and stories, all which Emma encounters with a philosophical frankness. I found myself immersed in these moments of Emma’s contemplation, thinking along with her as she wrung out the true meaning of living. Weiss excels in the mixing of these different beliefs not only through Emma’s own philosophical journey, but also in their accuracy as well. The amount of knowledge needed to put together such a stunning collection of myths is vast, and her intricate writing certainly proves that Weiss did her research. Elegant seems a good descriptor of Weiss’s writing style, as her sentences read like poems on the page. She describes every scene, moment, and character with such life. From the beautiful moments to the darker ones, each one convinces the reader that they could be within the story itself. Above all, I read Emma’s story as one of resilience. Her brief encounter with Lucifer leaves her with a power she didn’t intend to have but one she intends to use well. From healing, to gambling, to attempts to save the whole world from suffering, Emma’s story is one that represents the human capacity to do good. And she does this while anxious, alone, and scared. Though characters come in and out of Emma’s narrative, the story is hers alone. As her world and mind begin to unravel, this persistence becomes even more notable. Weiss did an excellent job in creating a strong, yet relatable female character. Though I was overwhelmed by Weiss’s capacity to narrate such a richly descriptive story, there are moments where this became too much. Beyond the prologue, much of the first part of the novel is a slew of information about Emma’s life. Though this information regarding her hardships feels necessary to understand Emma as a character, I felt it would have been better had these moments been posited throughout the story, revealing more of Emma bit by bit. It felt like a moment of telling, rather than showing. This seemed to repeat at the end, with excess information seemingly pushed on the reader within the final ten pages or so. In both parts, beginning and end, the novel felt slow; as if I had a job to get through to get to the real story. Despite this, the novel itself was thrilling to read. It is a book for anyone who is interested in the overlapping of religion and magic. It’s a story for anyone who wants to read about a lost soul finding her way and contemplating the world around her. 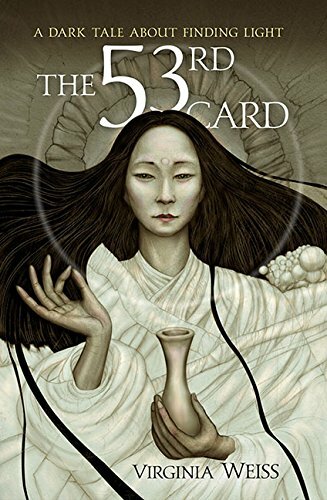 “The 53rd Card,” by Virginia Weiss excels in its capacity for description and openness of religion, delivering a story where the protagonist is given the opportunity to come head on with these forces and find her light.